Instead of just looking for whatever event Kevin Koe or Rachel Homan happens to be in, there are now other disciplines to consider when examining the calendar. Not only are there big World Curling Tour events in Red Deer, Alta., and Halifax, but there’s also a big mixed doubles event in Portage la Prairie, Man., and one of the biggest wheelchair curling events of the year in Richmond, B.C. The 12th Annual RCD International Wheelchair Bonspiel hosts 14 teams from around the world, including several Paralympic medal winners, and several more Paralympic hopefuls. Heading the field is most of Canada’s 2018 Paralympic squad — being skipped by Dennis Thiessen of Sanford, Man., this weekend. Mark Ideson of London, Ont., the usual skip, played the first three games, but was sidelined to a minor medical issue. Thiessen and vice-skip Ina Forrest of Armstrong, B.C., each have two Paralympic medals (gold in Sochi 2014, and bronze in Pyeongchang 2018), and will competing under the banner of “Team Canada 2” for this event. Also in the mix is two-time Paralympic gold-medallist Jim Armstrong, now playing out of Cambridge, Ont. Most of his team members are, or have been, part of the national team program at some point. The event boasts teams from Alberta, Ontario, Quebec, and three more from South Korea. In the Mixed Doubles world, the Canad Inns Mixed Doubles Championship in Portage features the who’s-who of mixed doubles pairs. Kaitlyn Lawes and John Morris are in the field, looking to add to their Olympic gold-medal resume. 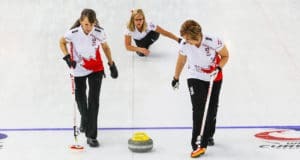 Joanne Courtney and Reid Carruthers, along with Laura Walker and Kirk Muyres, are both national Mixed Doubles champion teams, and they’ll also be in the 32-team field. The rest of the field is stacked with Tim Hortons Brier and Scotties winners, as well as a few world champions. They’re playing for a share of the $36,000 purse. In traditional four-player curling, the action is split between Halifax and Red Deer. Halifax is hosting the Stu Sells 1824 Halifax Classic, with 16 teams battling over the $25,000 purse. The favourites in the event would have to be Brad Gushue (St. John’s) and Glenn Howard (Penetanguishene, Ont. ), although hometown hero Jamie Murphy (Halifax) has been playing very well this season, having won two events. At the Red Deer Curling Classic, Brendan Bottcher (Edmonton) headlines a 28-team event that also features two-time Canadian junior champion Tyler Tardi (Langley, B.C.). 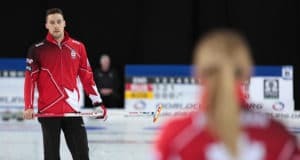 Crowd-favourite Jamie Koe (Yellowknife) is also in the mix, along with some international flavour in the form of Scotland’s Glen Muirhead and South Korea’s Jongduk Park. On the women’s side in Red Deer, former Scotties champ Amber Holland (Regina) is in the mix, as is Home Hardware Canada Cup-bound Casey Scheidegger of Lethbridge, Alta., two-time World Junior champ Kelsey Rocque (Edmonton) and international teams from Switzerland, South Korea, China and the U.S. Both the men’s and women’s competitions offer a $35,000 purse. 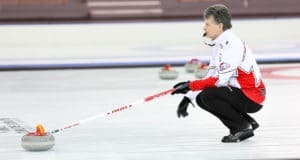 Scores and event updates are always available at curlingzone.com. Previous: Travelers Club Championship gets underway Monday in Miramichi, N.B.